At 413-415 S. Rampart Street in New Orleans stands the Iroquois Theater, where a young Louis Armstrong won a talent show in whiteface. Down the block is the Karnofsky music store, where the Karnofskys, a Jewish immigrant family that “adopted” Armstrong, lived and worked. The two buildings are listed on the National Register of Historic Places, though they are in serious disrepair. There are thousands of locations where it could be said jazz took root in New Orleans. The many clubs where the pioneering musicians hung out and played, the music schools where they learned, and the homes where they lived all played a role. But these few crumbling buildings on Rampart Street are considered to be the birthplace of jazz. While the New Orleans Jazz Fest is held at the Fair Grounds, these two historic buildings are about to be restored by a prominent real estate developer, River Park One LLC, which just acquired the two buildings in a swap of properties with The Arlene and Joseph Meraux Foundation. Joseph Georgusis of River Park One said, “We look forward to placing these buildings back into commerce in a way that pays tribute to their rich history and importance to our community and country. The public can expect work to begin restoring the historic facades of both buildings and a plaque installed to honor what took place inside.” There are no details yet on how exactly the two buildings will be used commercially. 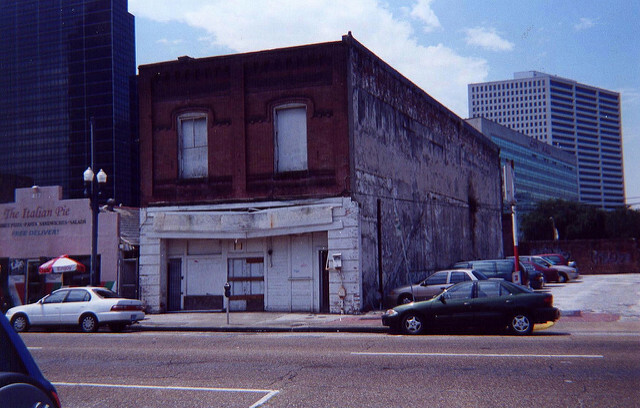 There is another initiative underway to restore the nearby Eagle Saloon on Rampart Street. The goal is to have these buildings standing proudly in time for the New Orleans tricentennial in 2018. New Orleans is known for some more recent firsts, including having the nation’s first all-charter school system, but it will always be known as the birthplace of jazz. Jazz began to emerge as part of a broad musical revolution encompassing ragtime, blues, spirituals, marches, and “Tin Pan Alley” standards. It also reflected the profound contributions of people of African heritage to this new and distinctly American music. When New Orleans musicians became known in other parts of the nation by the 1910s, jazz became an established genre. This emerging form of music needed a new name to distinguish it from “Ragtime.” There are many opinions about what is important in the history of jazz. One indisputable fact about New Orleans, though, is that jazz was never a luxury; it was and remains a necessity. Jazz was the culmination of the diverse ethnic and racial groups of New Orleans finding common cause in their love of music that eventually became jazz. While volunteering is something all nonprofits rely upon, the model Operation Nehemiah is advancing can teach nonprofits, as well as those concerned about the efficacy of nonprofits in their community, something important about cooperation.